This is a mineral based highlighter with prismatech shimmer revitalizes skin with subtle sheen. Luxurious pearls and soft texture provides an etheral glow with a polish finish. This beautiful Highlighter, like the name says, has beautiful swirling colors with pearl, pink and gold tones to it. It blended out so well and my skin is absolutely glowing. The texture is powdery/creamy and pigmented beyond belief. I barely tap my brush into the pan and I get enough product for both cheeks. I really like it because it gives me the natural glow that I want without being sticky, heavy, or glittery. I wear this on top of the bridge of my nose, cheek bones, inter corner of my eyes and on my cupid's bow. It lasts all day and makes me look fresh and well rested. It comes in a beautiful and well made Gold and translucent package and it looks very luxurious. All Mirabella beauty products are Gluten Free and Paraben free. The creamy texture and smooth finish provide just enough shine without leaving a wet/glossy look plus it never dries out my lips which is usually a problem for me. It is a very moisturizing and hydrating formula. They come in a twist up container making it very easy to use, the colors are very intense and very pigmented, and they last almost all day. I reapply them once or twice a day depending on how many times I drink or eat throughout the day. They have a light/pleasant sweet scent. 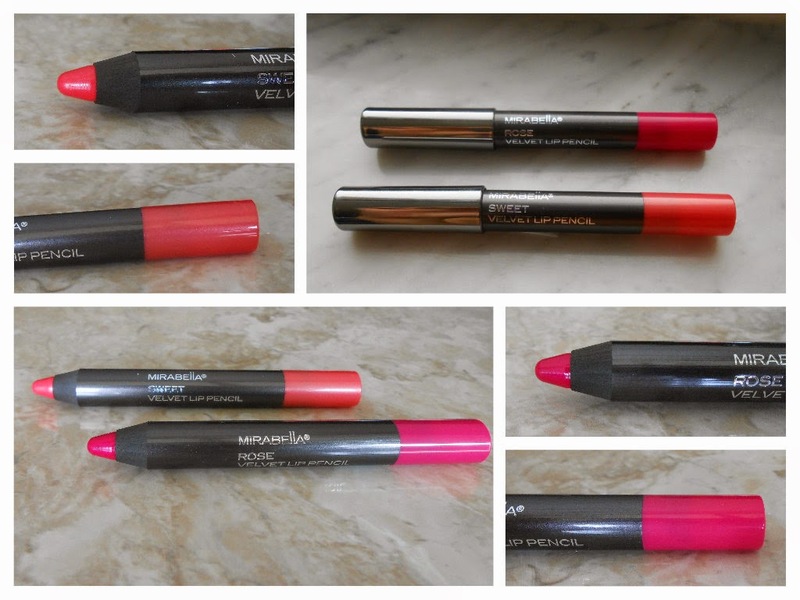 These lip pencils come in 6 different shades, between nudes, bright, and dark tones. Sweet is a beautiful pink color with coral undertones that screams spring, this is a shade I will wear everyday. Rose is a vibrant hot pink color that is blue based making you look radiant and glowing. This eye makeup remover is perfect for the sensitive and gentle eye area. I wear waterproof mascara on a regular basis, and this takes off every last bit of it without scrubbing. It completely works to take off the eye makeup (even eyeliner) and has never given me an allergic reaction. Some makeup removers can be harsh on the skin, but this one isn't at all. This is a double action product that contains antioxidant and natural ingredients that also help improve the appearance of your skin eye area. Not greasy, it washes off easily, and doesn't leave residue. My skin feels soft and nourished after each use. Very little required to do the trick. It comes with a pump dispenser, I like it because I can control how much product I use. One pump is more than enough for each eye. This makeup remover is alcohol free, oil free and paraben free. I love the highlighter! So pretty! I haven't tried this brand. That shimmer is gorgeous. I LOVE that mineral highlighter! I definitely have to check it out, it's gorgeous! Love the sweet lip color. Gorgeous! Thank you for a well written, enjoyable, review. This sounds like a great line! I love those lip pencil colors. Those pinks are so bright and full. I really like those colors! That remover would be awesome too. I haven't tried this brand before but it looks really good. Thanks for the review! This is really great! I love the color of the lipstick! I need to try this out sometime! I will need to show this to my daughter. She is always interested in new products. I really love that color on you, it looks very nice. I need some new beauty products, time for a trip to Ulta! What a great review! I love the colors they offer! My daughter is always looking for new gluten free makeup. I'll have to tell her about this brand. I've never heard of this brand. I love the shimmery color of the highlighter. Both lip shades are really pretty. I'd love to have some of that highlighter for a pretty summer glow! These sound like great products! I haven't tried this brand before. Sounds like a great product to check out! I haven't tried this brand before! Sounds great and like worth checking out! I haven't heard of this brand before. I like all the colors. It sounds really great I will have to check them out! I love this lip color. It would be great for spring. I will have to try the makeup remover. I love those lip colors. They look bright and vivid and also soft on your lips. I hate sticky lip colors. That Sweet lip color is beautiful! That could easily be my go to lip color for summer! I am loving those lip pencils. I've never heard of that brand before though.